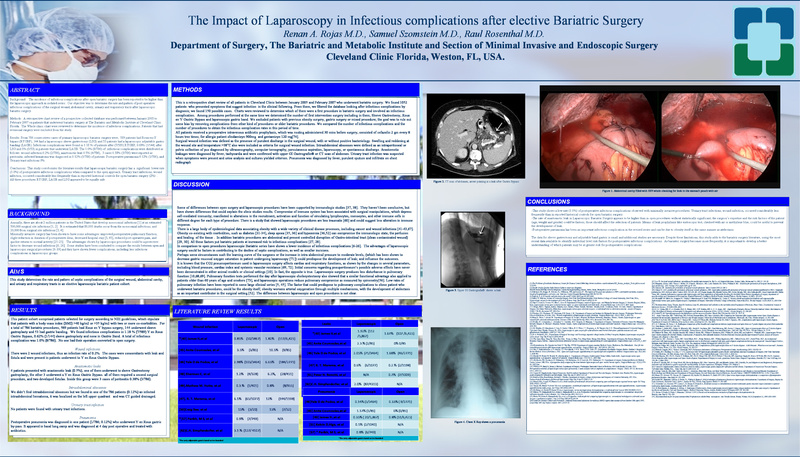 Background: The incidence of infectious complications after open bariatric surgery is reportedly higher than in the laparoscopic approach, in some isolated series. Our objective was to determine the rate and pattern of postoperative infectious complications of the surgical wound, abdominal cavity, and urinary and respiratory tracts after laparoscopic bariatric surgery. Methods: After IRB approval, a retrospective medical record review of all patients who underwent bariatric surgery at our institution was undertaken. The discharge summary, operative report, and medical records were reviewed to determine the incidence of infectious complications. Patients who had revisional surgery were excluded from this study. Results: A total of 786 consecutives cases of primary laparoscopic bariatric surgery were performed during the study period; 589 underwent laparoscopic Roux-en-Y gastric bypass (LRYGBP), 144 had laparoscopic sleeve gastrectomy (LSG), and 53 had laparoscopic adjustable gastric banding (LAGB). Eight (1%) infectious complications were noted; 7/589 (1.18%) were after LRYGBP, 1/144 (0.69%) were after LSG, and (0%) after LAGB. Infectious complications included wound infection in 0.2% (2/786), anastomotic leak in 0.5% (4/786), peritonitis in 0.38% (3/786), infected hematoma in 0.12% (1/786), and pneumonia in 0.12% (1/786). Conclusions: This study corroborates the results in the literature that laparoscopic bariatric surgery has a significantly lower infectious complication rate (1.0%) when compared to the open approach. Urinary tract infection and wound infection occurred considerably less frequently in our study than in reported historical controls for open bariatric surgery (2%). In addition, all three procedures appeared to be equally susceptible to postoperative infectious complications.